Cabinets are a focal point in any kitchen. They can be stock, semi-custom or custom made. The designs and styles available can depend on the category of cabinet you choose. When considering new construction or a kitchen remodel, there are five popular designs to choose from for your cabinets. The rustic look of your home can extend to the beauty of your cabinets. The wood used to make these cabinets is heavily grained in wood varieties such as knotty pine, alder and hickory. Green, yellow and red are common stains used. The flat panel door system is an available option. The country look is more natural using woods such as cherry and oak. Using natural colors, the cabinets themselves add to the traditional country style of the kitchen. The panels are often raised and distressed, glazed or painted. Distressed painting gives the cabinets an aged-look. Modern elements are infused into contemporary cabinets. No molding or ornamentation graces the curved, geometric or modern designs. Innovative and fun styles are used such as bright colors, stark white or black, and stainless-steel designs. Doors often open horizontally. 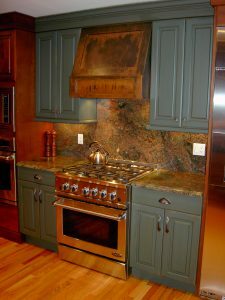 Bold colored woods such as mahogany, cherry and walnut bring a richness to traditional kitchen cabinets. The traditional design features the intricate ornamentation and molding work such as crown, fluting, rope and corbels. Victorian, Italianate and Georgian designs are common in the traditional style. Combining the elements of traditional and contemporary designs gives you a transitional style. Natural and manmade materials combine for a creative kitchen. Beyond the design of the cabinets, consider any functionality needed such as a spice rack, lazy susan or pot drawers. Kitchen cabinets installed by a professional can ensure an even look and handle any issues with craftsmanship. The end result is a beautiful kitchen that adds value to the home.